Shadow Hills Golf Club's south course is the perfect marriage of a championship golf course and the breathtaking scenery of a desert setting. Teamed with its sister north course, Shadow Hills gives golfers a perfect place to find great Indio golf deals. The south course has been welcoming golfers since 2004 and combines long, rangy fairways and fast greens in its 6,773-yard, par 71 package. The Schmidt-Curley design plays to a 72.9 rating and a 134 slope. Bunkers and water hazards dot the course and keep players thinking. Players rave about the course's immaculate appearance, which blends with the rich, deep colors of its surroundings. 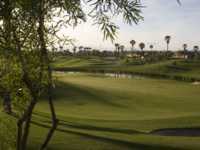 Anyone looking for Indio tee times can find plenty of Shadow Hills Golf Club - South discounts at Click4TeeTimes.com. The club's practice facilities have a driving range, a short game area and putting greens that match the speed of the course. The pro shop has everything to succeed on the course, including club rentals if needed. There are a number of lesson options for players looking for a few tips, including six 30-minute sessions or a nine-hole playing lesson with a member of the club's professional staff. Shadow Hills is a great place to host any special occasion. The Shadows restaurant has menu options throughout the day along with happy hour specials and a friendly atmosphere.